Earlier I explored “What Does It take to Sink a Ship?” as a measure of what it takes to be absolutely sure you can stop one. Then the Japanese Tsunami gave us fishing vessel Ryou-Un Maru, a small vessel USCGC Anacapa attempted to sink with their 25mm gun. Anacapa ultimately resorted to coming along side and using a fire hose to fill the vessel with water, but it took over five hours. Now the Navy provides us with information about another Sink-Ex. The former USS Rentz (FFG-46), a 4,200 ton, 453 foot long frigate, was the target. In spite of being hit by 22 missiles, she took five hours to sink. The last hit or hits were by Hellfire, and may not have been necessary, but not all the missiles were that small. The caption below appears to indicate at least two Harpoons were used. Photo: US Navy. 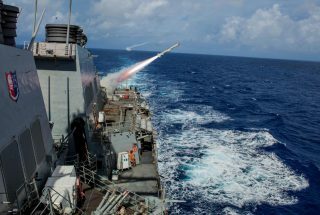 Guided-missile destroyer USS Benfold (DDG 65), foreground, and USS John S. McCain (DDG 56) fire Harpoons missiles as part of a sink exercise (SINKEX) during Valiant Shield 2016. Reports also indicate that at least one JSOW C-1, an over 1000 pound guided gliding munition with both Infra-Red and Link-16 guidance, was used. The caption on the photo below seems to indicate multiple AGM-65F were used. These are infra-red homing, Air to Surface Missiles, weighing over 600 pounds with a 300 pound warhead. U.S. Navy sailors with Patrol Squadron 46 load a P-3 Orion aircraft with AGM-65F MAVERICKs, prior to a sinking exercise (SINKEX) Sept. 13, 2016, at Andersen Air Force Base, Guam, during Valiant Shield 2016. When the video at the head of this post begins, it appears that the ship has already taken at least three major hits. I suspect these were two Harpoons and possibly the JSOW C-1. I suspect the four hits seen in the video were Mavericks launched from the P-8 that made the video. The video below shows a Hellfire hitting what appears to be an already sinking hulk. It appears to me, the effects are clearly less than those seen in the video at the top of the post. I would love to have a clearer idea of the sequence and effects of the individual hits, but one thing is clear. It took a lot of ordnance to put even this relatively small ship down. The Coast Guard’s 25 mm and 57 mm guns, with their five ounce and six pound projectiles, will not cut it. This entry was posted in Sink-Ex, Weapons by Chuck Hill. Bookmark the permalink. And they would think of sending the CG into action in war time, against who? The Coast Guard has participated in every major conflict since it’s inception. There is also the being able to stop a larger commercial ship. Chuck has covered the topic extensively. The only thing I ever witnessed personally that the CG was able to out-do the Navy on was their small boats, had turbo charged diesel engines vs our naturally aspirated straight 6 cummins. If i’n not mistaken, during the Normandy landings they had praise from the troops in the landing craft. In fact the CG had to give a few training sessions prior. Thank you, Malph, I was addressing the Ports, Waterways, and Coastal Security mission, but Defense operations is also a consideration. The relative size of the Navy and the Coast Guard has been changing and the potential CG contribution is more important now than ever before. In terms of number of personnel, the CG is now larger than either the British or French Navies. Formerly: Cm3 johnson(SW) the USS Rentz (sunk in the video) was my first command while in the Navy. From all the work I did upon that surprisingly powerful vessel of old, I worked regularly with the Coast guard and every time it seemed as if they attempted to steal the credit from The hard working sailors on my ship. Not saying that all uscg sailors are that way, But I will say that it will always be the few that make the impression for all the rest. I lost most but not all respect for the Coast guard with that command. @David, sorry to hear you feel that way. It is also a common complaint in the CG that others (notably the Navy or Customs and Border Protection) are stealing credit for work the CG does. I’ve seen a lot of CG news releases that identified Navy vessels and other units and services that were involved in drug interdiction. I suppose it is easy for PAOs to report on their own units and fail to mention other units that were also essential in a successful operation. Amen to that one. Recently i read a chapter in a book of the river boats and 83 footers in Vietnam. The Marines never hesitated to brag up the CG men. Not that we’re here to see who was the best because we as Americans are all on the same page. I don’t believe that it is still necessary to sink a ship to take it out of the fight. Rather, what I think is important is a mission kill. Since the duration of modern warfare is so short nowadays, taking a ship out of the fight for 6-8 weeks is almost the same as a sinking, since it is unlikely the ship will be returned to line service before the end of hostilities. During WWII, a 4-7 year war, you needed to sink the ship because we could repair it in 2-3 months and send it back in and there was still plenty of fight left in the war. Now, its all over in a few weeks. So with that in mind, what weapons are best suitable to provide a mission kill? I think that modern missiles so a pretty good job of that. Stark is an example. Samuel B Roberts is another one taken out of the “fight” from mines. Personally, I think the age of ship to ship naval gunnery is over. Guns are used as intimation more than anything. For the Ports, Waterways, and Coastal Security mission, a mobility kill seems the quickest way to a mission kill. Once we stop them from getting to the objective, we will have time to deal with them using a whole range of assets. That is why I have been advocating a light weight anti-surface torpedo. It probably will not sink the target (unless it is under 1,000 tons), but it could be a relatively sure mobility kill capability we could put on the small cutters that actually might be there when we need them. The other approach I have suggested, https://chuckhillscgblog.net/2016/06/21/why-the-coast-guard-needs-lrasm-in-peacetime-cimsec/, requires a sophisticated, relatively long range missile system, and a relatively sophisiticated network for coordination. It does on the other hand make the Coast Guard more ready for a modern war. I have much less confidence a future conflict will be short unless it goes nuclear. That always seems to be the presumption, but it doesn’t usually work out that way. In a non-nuclear conflict with China or Russia (or both) for instance, neither party is likely to be able to invade the other and force a termination, and once begun wars are seldom follow a logical path. Nations continue to fight for years after the cause is clearly lost. It takes a long time to disassemble a modern nation. At any rate, it is only during long wars (or at least a long build up to war) when the CG has time to be redirected and reequipped to join the fight. Wow, and just to think: there were no damage control teams operating either!